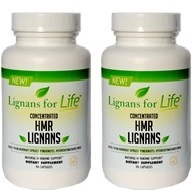 HMR Lignan 40 mg Two Pack For People or Dogs. 90 capsules per bottle, 180 capsules total. 180 servings. Lignans are phytonutrients that are converted in the body into enterodial and enterolactone, mammalian lignans that mimic estrogen. This weak (cleaner) form of "estrogen" attaches to estrogen receptors in the body, blocking naturally occurring (and potentially harmful) estrogen from attaching to those receptors. The normally occurring (endogenous) estrogen is then flushed from the body. Many studies indicate that people with high amounts of lignan in their bodies have better reproductive organ health and studies indicate reduced rates of reproductive organ cancers in people with high amounts of lignan. ** This is due to the hormone balancing properties contained by lignans, which block the action of more harmful estrogen in the body. Over time, this harmful estrogen can cause negative responses in the body.